Jasmine Oolong is a favorite beverage for all seasons. It produces a pale yellowish brew with a rich and distinctive flavor expertly infused with the sweet, delicate fragrance of fresh summer jasmine. The tea has a very light and subtle jasmine flavor. I love this Jasmine Oolong! It is wonderful! 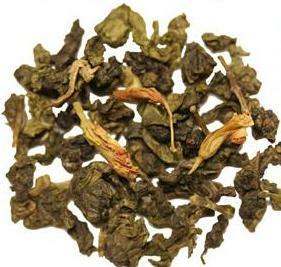 The Oolong tea is light in flavor with a smooth, silky mouthfeel. Just slightly vegetative but with very little buttery taste that is often associated with the greener Oolong varieties. It has a hint of fruity taste as well, just barely there, lingering in the background. There is a light astringency to it that seems to wash over the mouthfeel just enough so that it doesn’t impart a slick feeling in the finish. The aftertaste is lightly floral. The jasmine is so beautifully delicate in this cup. It doesn’t overwhelm the palate and it isn’t too sweet or too sharp… a pleasant balance of characteristics to this jasmine, and I like that it doesn’t interfere with the complexity of the Oolong. I steeped this in a gaiwan – steeping just 45 seconds for the first steep, and increasing the time by 15 seconds for each subsequent infusion. I managed eight very flavorful infusions this way. The sumptuous flavor is so comforting and delightful! This is a tea I’d recommend to those who wish to explore jasmine but find some of the green jasmine teas to be a bit too sharp or overwhelming. This jasmine may just be the perfect jasmine for you! This is a rare and expensive tea grown in Zhejiang province. In Chinese medical journals the Tianshan Lushui is known to lower cholesterols and help with weight loss. This tea produces a green color liquid. The better its quality is, the greener the color. 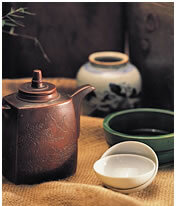 This tea has traditionally been used as a diet tea in palaces by the empress and princesses of ancient China. Because this tea is very concentrated, we suggest using one teaspoon of tealeaves for every 500ml of water. These tiny leaves are so much fun to watch as they brew. When I first watched them, the first thought that came into my head is that this is “instant gratification for tea watchers” – because it unfurls much like a gunpowder or pearl, but much faster. It is kind of like watching a gunpowder tea unfurl in fast forward. I was a little afraid to taste this tea, to be honest. When the name of the tea is “bitter” – I get a little worried. But, really, this is “bitter” in a good way. Kind of like dandelion greens. And that is a really good description of this tea, because when they unfurl, the damp leaves look like baby dandelion greens! Really tiny, baby dandelion greens! This is actually quite good. It has a savory quality that I’m finding very rewarding. The key is to not over brew it, I found that with a short brew time (I brewed it for about 1 1/2 minutes in hot but not boiling water) the flavor is lightly bitter, with an interesting sweet background note. It’s a very crisp, bright, herbal taste that I’m finding rather energizing. Vibrant! I also recommend not using too much leaf when you brew this, because the flavor is quite intense. Too much leaf will result in a cup that is quite bitter, and because the bitter is so overwhelming, it is difficult to enjoy the other flavors that this tea possesses. A lighter infusion allows the many dimensions of this leaf to come alive in the teacup! By now, you might be wondering what “Tianshan Lushui” is – is it a tea (as in Camellia Sinensis) or is it something else? Well, I was not entirely sure if it came from the Camellia Sinensis plant, so I contacted Enjoying Tea for more information. I was very impressed with the speed in which they responded! They informed me that it is in fact an herb and not from the Camellia Sinensis plant. 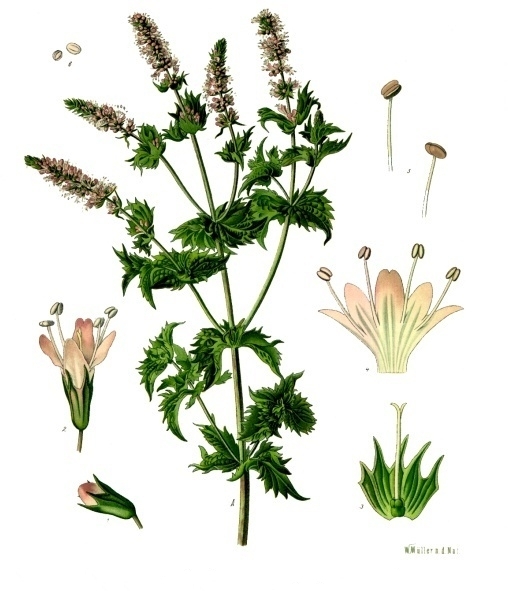 I also did a little research of my own, and found that this herb is also often called “small-leaf bitter tea.” It is often utilized to help cool the body temperature, as well as help to lower cholesterol and improve blood circulation. It’s also supposed to be good for the skin! So while it’s not a true tea, it is a tasty herb and very good for you! Cheers! This perennial herb, native to Southeast Asia is noted for its lemony scent and ginger undertones. In Thailand, lemongrass is believed to calm the nerves and restore the spirit. The lemony flavor of lemongrass is used to flavor everything from curry to Thai milk shakes. Lemongrass is delicious brewed on its own or enjoyed with your favorite tea. This Lemon Grass has such a pleasant, bright flavor. Like the name of this herb suggests, it has a lemony taste – but what I like about lemongrass over a lemon is that lemongrass doesn’t have the same tangy/tart/pucker-ish character of a lemon. Instead, it is like the sweeter side of a lemon – fresh, vibrant, and appealing. It also has a delicate buttery taste to it that I really like. Over the past few months, I have really become a fan of this lemongrass from Enjoying Tea. It has that light, lemony flavor that I really enjoy. It is soothing when I have a sore throat; restorative when I feel drained; and refreshing when I want a hot beverage but desire something a little lighter than tea. It also blends so well with other teas – I like to add a little to unflavored white tea or honeybush for a little extra flavor. Lemongrass is also excellent served hot or iced. I especially like it hot on chilly evenings. It is naturally caffeine free and very uplifting. For an extra treat, try adding just a little candied ginger to the brewed lemongrass – it sweetens it just a little bit and accents the natural ginger-like undertones of the lemongrass. Delicious! This wonderful field grown and sun-dried spearmint is from Washington State. Spearmint is highly appreciated for its digestive properties and its ability to relieve nausea. It’s often used to help relieve headaches and tension. Use spearmint to add a kick to your favorite tea! I really don’t drink a lot of herbal teas. I prefer teas with Camellia Sinensis (the tree from which tea leaves are harvested) rather than herbal tisanes, but later in the evening, I really like to sip on a “tea” – but I don’t really want all that caffeine keeping me up all night. That’s when I usually turn to herbal teas. And, sometimes, it’s nice to wind down after a long (and spicy!) day with something fresh and pure like this Spearmint. Spearmint is often used to help with digestive discomfort, so it’s especially good after eating something spicy (tonight we had tacos!) Plus … it leaves the mouth feeling minty fresh – a nice bonus. This is pure Spearmint from Washington State (which is where I live), and the taste is crisp and clean. It has a natural sweetness to it – so it doesn’t need any sweetener. It doesn’t taste medicine-y or like mouthwash – it tastes light and refreshing. Not something that I drink all the time… but I’m really enjoying it right now! It is also a great “tea” to keep on hand, because it makes a great addition to other teas should you wish to “kick it up a notch” (to borrow a catch phrase from a well-known chef). I especially like to add a little Spearmint to plain, organic honeybush for a minty, sweet, late-night treat!